Combine the spinach and fenugreek, add salt and allow to rest for 10 minutes till the liquid is released. Use this liquid to bind the puri dough. Add all the other ingredients and knead into soft dough, using a little water if required. Roll out each portion into a thin circle of about 40 mm. (1 ½ ") diameter. Prick the rolled out puris with a fork at regular intervals. 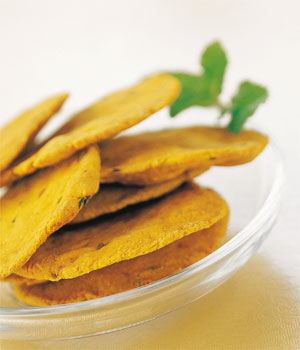 Bake in a pre-heated oven at 180 ° C (360 ° F) for 10 to 12 minutes or till the puris are golden brown. Again recipe copied from Tarla Dalal's website, u dont have your own recipes or what? Very interesting & healthy recipe pooja. Saves us 4m all those typical fried desi snacks. Thanks. Indeed very healthy and good, thanks for sharing.